Celery contains vitamin C and several other active compounds that promote health, including phthalides, which may help lower cholesterol, and coumarins, that may be useful in cancer prevention. Celery is not just extremely low in calories: you actually burn more calories chewing celery than you are consuming by eating celery! Celery juice and whole celery help burn fat. The chewing action releases hormones in the brain the reduce cravings. Research has shown that snacking on celery reduces the urge to eat unhealthy snack items. Celery has a balance of minerals that is very hydrating. When thirsty, we often over-eat. Because celery quenches thirst on a level beyond just drinking water, it prevents over-eating causes by thirst. Celery appears frequently in detox diet plans. This makes sense because celery has properties that aid digestion. Because celery is mildly sweet and contains sodium, it curbs cravings. All raw fruits and vegetables have detoxing properties. Celery in particular is excellent because it provides a mild detox and highly balanced nutrition. Celery is beneficial in cases of insomnia. Celery juice particularly is very calming to the nervous system. The high magnesium levels are soothing, and helpful to relaxation, and fully restful sleep. Raw celery aids constipation. The high fiber content "sweeps" the colon clean. Other helpful aids in the face of constipation include: psyllium husk, aloe juice, ginger, and turmeric. According to Hippocrates, the father of medicine, celery calms nerves. This may be contributed to by its high calcium content. Celery is good for the kidneys and will eliminate the body's waste through the urine. The seeds, leaves, and edible root of the plant can all be used. Celery seed in particular is very high in calcium, and it is one of the few seeds commonly available that has a positive calcium to phosphorus ratio. A single tablespoon of celery seed provides 11% of the recommended daily need for calcium. Ten large ribs of celery amounts to 102 calories. The calorie breakdown is 73.4% from carbs, 9.5% from lipids and 17.1% from protein. This is a highly ideal ratio if you're trying to lose weight or build muscle. To maintain healthy muscle you only need 10% of your total calories to come from protein (on a 2000 calorie diet), and celery contains protein in a more digestable form than foods such as meat and beans. I explain this in detail in my article about protein, amino acids and enzymes. 12% B1 (thiamine), 33% B2 (riboflavin), 15% B3 (niacin), 31% B5 (pantothenic acid), 36% B6 (pyridoxine), 58% B9 (folate), 20% vitamin A, 26% vitamin C, 12% vitamin E, 208% vitamin K, 26% calicum, 7% iron, 23% magnesium, 35% potassium, 5% selenium, 34% sodium and 10% zinc. All of that in just 100 calories! Celery has a lot of potassium. Potassium is an electrolyte that is good for maintaining a healthy nervous system. It is vital for proper brain function and normal muscle growth. It lowers blood pressure and helps balance normal water levels in your body. Lack of potassium can cause heart problems, fatigue, and dry skin. Coconut water from young Thai coconuts is extremely high in potassium content as well. Celery is rich in vitamin K, which will help to suppress the appetite. Vitamin K also helps to form normal blood clots, i.e. it's the vitamin that stops you from bleeding to death. Adults over age 50 should increase the vitamin K intake, as it aids in making essential bone proteins, preventing bone fractures and osteoporosis. A lack of vitamin K can cause liver problems, excessive bruising and bleeding. Celery contains phytochemical compounds known as coumarins. Studies have shown that coumarins are effective in cancer prevention and capable of enhancing the activity of certain white blood cells. Coumarin compounds also lower blood pressure, tone the vascular system, and are possibly effective when used in cases of migraines. Due to the high levels of potassium and sodium, when celery-based juices are consumed after a workout they serve as great electrolyte replacement drinks. Studies have also shown that celery may help to lower cholesterol and prevent cancer by improving detoxification. Celery extract that contains 85% 3nB, has been shown to be effective in the treatment of "rheumatism". That is, celery is effective against arthritic and muscular pains. Celery provides an excellent source of vitamin C and fiber. It is a very good source of folic acid, potassium, and vitamins B1 and B6. Celery also offers a good source of vitamin B2 and calcium. Even though celery contains more sodium than most other vegetables, the sodium is offset by it's high levels of potassium. Studies have shown that the sodium content of celery does not bother even the most salt-sensitive individuals. And yet, if you ate enough celery, you could meet all of your sodium needs on celery alone. Celery is an excellent source of vitamin C, a vitamin that helps to support the immune system. Vitamin C-rich foods like celery may help reduce cold symptoms or severity of cold symptoms; over 20 scientific studies have concluded that vitamin C is a cold-fighter. Vitamin C also prevents the free radical damage that triggers the inflammatory cascade, and is therefore also associated with reduced severity of inflammatory conditions, such as asthma, osteoarthritis, and rheumatoid arthritis. As free radicals can oxidize cholesterol and lead to plaques that may rupture causing heart attacks or stroke, vitamin C is beneficial to promoting cardiovascular health. Owing to the multitude of vitamin C's health benefits, it is not surprising that research has shown that consumption of vegetables and fruits high in this nutrient is associated with a reduced risk of death from all causes including heart disease, stroke and cancer. For more about vitamin C, read this article containing ten different ways to get a full day's supply of vitamin C from whole foods. Celery's potential for reducing high blood pressure has long been recognized by Chinese medicine practitioners, and Western science researchers may have recently identified one reason why: Phthalides. Celery contains active compounds called phthalides, which can help relax the muscles around arteries and allow those vessels to dilate. With more space inside the arteries, the blood can flow at a lower pressure. Phthalides also reduce stress hormones, one of whose effects is to cause blood vessels to constrict. Research has shown that celery can rapidly reduce blood pressure upon consumption. In studies of animals specially bred to have high cholesterol, celery's cholesterol-lowering activity has been demonstrated. In eight weeks, aqueous solutions of celery (like celery juice) fed to specially bred high cholesterol animals significantly lowered their total cholesterol by increasing bile acid secretion. Grated raw celery can be used on swollen glands. Celery is used in aromatherapy and other traditional ways of healing, like Ayurveda. In Japan, rheumatic patients are sometimes put on a celery-only-diet. As stated before, celery is also a useful component of a detox diet. Available year-round in the U.S.
Look for firm, tight bunches with healthy leaves. Avoid bruised celery as it will taste bitter. When celery (or most any plant) is damaged, it releases bittering agents to fend off bugs. Refrigerate in a plastic bag (preferably a green bag) and place in the crisper for up to two weeks. If the ribs are wilted, separate the ribs and place them in a bowl of ice water for several minutes before use. You can also store upright in a vase with a little water or a wet towel at the bottom of the vase inside or outside the fridge. Wash thoroughly, as the bunch attracts sand. 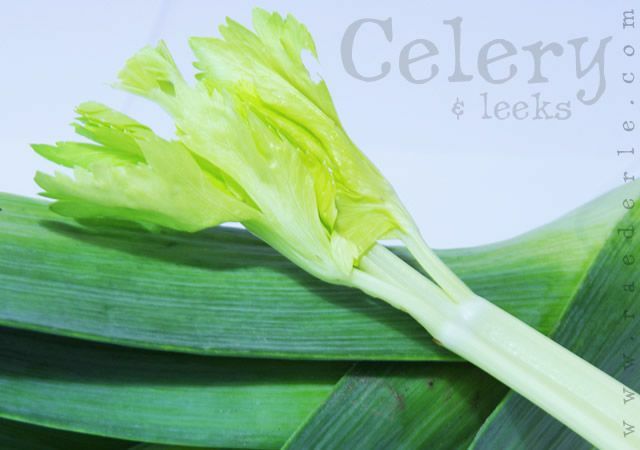 Celery can be boiled, braised, eaten raw or steamed. I recommend enjoying it raw to get the full benefits. Vitamin C and many other compounds will be entirely ruined by heating celery to high temperatures. Celery is also good to add to fruit and vegetable smoothie. Click here to check out a smoothie recipe including celery (which includes a how-to video). Celery is good to combine with just about anything. Flavor wise, celery goes great with fatty foods such as avocado, almonds and walnuts. Also, curry, celery seeds, dill, fennel, lemon, nutmeg and parsley are great with celery. In terms of digestive combinations, celery is one of the only foods that can be combined with fruit without causing a digestive upset. For more about healthy digestive combinations, read my food pyramid page. Celery is a biennial vegetable (meaning it has a normal life cycle of two years) that belongs to the Umbelliferae family, whose other members include carrots, fennel, parsley and dill. While most people associate celery with its prized stalks, its leaves, roots and seeds are also used as a food and seasoning as well as a natural medicinal remedy. Apium graveolens is a plant species in the family Apiaceae commonly known as celery (var. dulce) or celeriac (var. rapaceum) depending on whether the petioles (stalks) or roots are eaten. Apium graveolens is used around the world as a vegetable, either for the crisp petiole (leaf stalk) or the fleshy toproot. The root of the celery is also often eaten, which tastes similar to parsnip. Celery root is sometimes grated for use in raw recipes imitating rice. In temperate countries, celery is also grown for its seeds. The seeds are actually a very small fruit. These "seeds" yield a valuable volatile oil used in the perfume and pharmaceutical industries. They also contain an organic compound called apiol. Celery seeds can be used as flavouring or spice, either as whole seeds or ground and mixed with salt, as celery salt. Celery salt can also be made from an extract of the roots. 1. Slice up several bunches of celery finely. 2. Dehydrate celery slices at 105 degrees F overnight or however long it takes for them to become completely dry. Flip pieces as needed. 3. Blend dehydrated celery flakes with celery seeds (to taste). 5. Store in a glass spice jar and use as you would use regular sea salt. The celery salt I make can be referred to as a "Veggie Salt" because all of the sodium content comes from whole foods. Veggie salts are much healthier than any other salt, including sea salt, because veggie salts contain other minerals besides sodium in plenty. While sea salt contains some other minerals, it doesn't really compare to that which you'll get from dehydrated celery, celery seeds and dulse. Celery salt is used as a seasoning, in cocktails (notably to enhance the flavour of Bloody Mary cocktails), and in Old Bay Seasoning. Celery, onions, and bell peppers are key in Louisiana Creole and Cajun cuisine. Celery, onions, and carrots make up the French mirepoix, often used as a base for sauces and soups. Celery is a staple in many soups, such as chicken noodle soup. Celery is important for any raw vegan who is avoiding consuming excess salt in the crystallized form that is added to food. Getting enough sodium is vitally important to hydration and overall health, although most Americans get too much sodium in their diet. In an episode of my radio show I mention a woman who went raw and actually fainted from lack of sodium. Most raw foodies add sea salt to their salads to their own taste, but some 'natural hygienists' prefer to get all nutrients from plants. If you're going to seek out sodium exclusively from plants then I recommend listening to the episode of my show I linked in the previous paragraph. In that episode I explain precisely how to get enough sodium from whole foods alone.